If you don’t want to hear about food and fashion then this is where you get off, sorry folks! 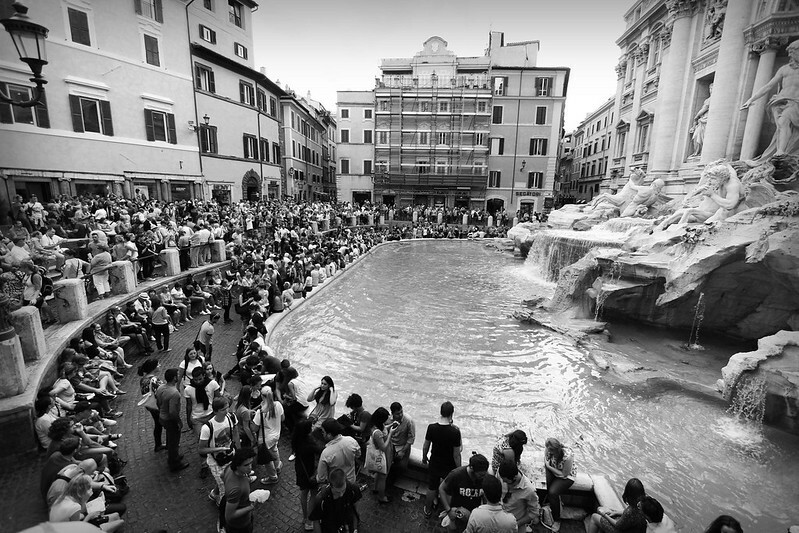 Crowds at the Trevi Fountain. After our midnight arrival from Istanbul and surly mini cab driver who waited around at the airport til 1am hoping for more passengers after saying we’d be leaving in 10 minutes (do not even get me started on how much I hate Rome’s airports and all who dwell within them – it’s a long story) we eventually got to our hostel and grabbed a few hour’s sleep. Half the hostels here seem to have a daily lock out policy – that is, you must be out of the hostel between 10am and 3pm so they can clean the place and it probably discourages some kind of nefarious activities that I can’t quite imagine people wanting to do around midday in a bog-standard hostel. So this resulted in us being up relatively early and making our way to a couch surfing meet up, where a guy had offered to do a free 2 hour walking tour of the ‘non touristy’ bits of Rome. Luke and I were, as is always the case, the first people on the scene. 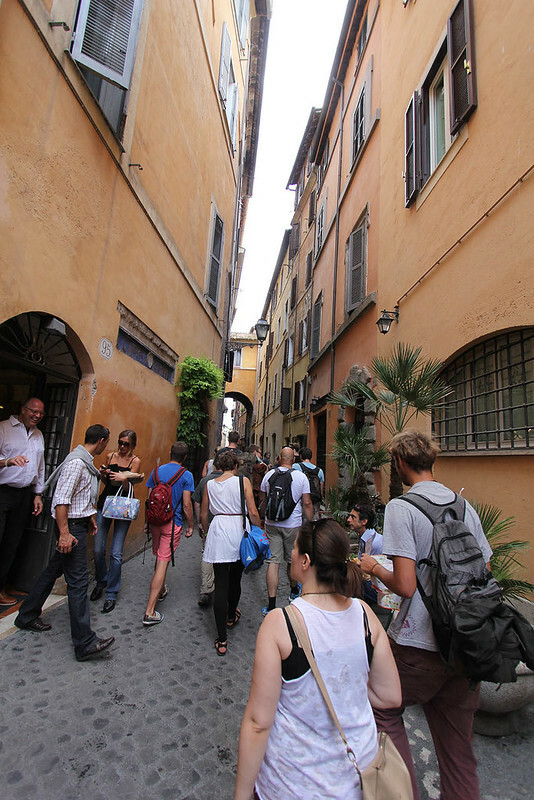 Eventually a group of about 15 people gathered and our tour guide, Alessandro, turned up. To say the guy looked flustered and disorganised is to put it mildly. He seemed like he’d had a big night out and his heart wasn’t in it. He’d explain something as ‘You know about Romulus and Remus, right?’ and if one or two people nodded their head he’d gloss over the story with ‘and so on and so on’, which was not exactly helpful. I know a bit of Roman history so I could explain a bit to Luke but our hopes were not set especially high in the beginning. 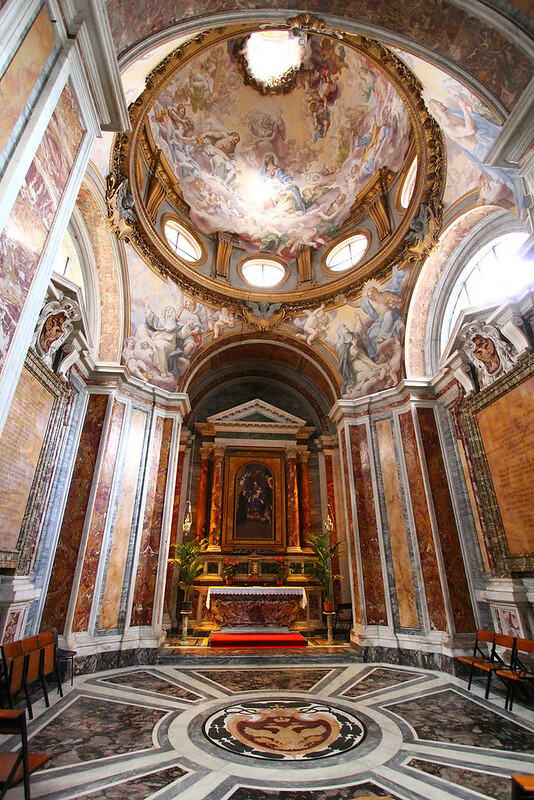 Apparently there are enough churches in Rome to go to a different one every day of the year. But then Alessandro started getting on track and telling us really interesting things and the tour turned out to be really great. We saw through the keyhole of the Knights of Malta‘s establishment, some beautiful and unusual churches and a garden with interesting forced perspective and saw a rock, supposedly hurled by the devil at some guy who was praying. Oh and we saw a church for a saint whose name I missed but who lived under some stairs for a while so his shrine has stairs. I called him Saint Harry Potter. Our feet were getting quite tired after a while so we stopped for gelato, which helped. Then we stopped for antipasto plates and wine, which was fantastic. We tried food in combinations I’d never had before – like parmesan and honey, which totally works. There was also zucchini flowers stuffed with fresh cheese – I’ve fried my own flowers with mince before but had not thought to have them fresh. 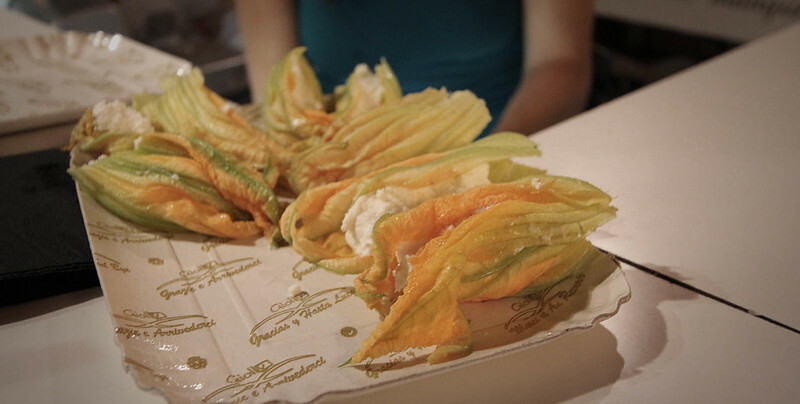 My favourite bit was when Alessandro told us that only in Rome can you eat Jewish Roman cuisine, but right now Roman artichokes weren’t in season and they use other artichokes and they ‘ruin everything‘. That’s right, an artichoke grown 100kms away will make your dining experience a complete waste. There’s something so delightfully Italian, whimsical and fussy about this statement and the casual but slightly depressed manner in which it was delivered. It as probably my favourite Roman moment out of all our time there. The tour was both improved and slightly ruined by the fact that it was a couch surfing thing and so we all tried to both listen and chat throughout. When you meet up with a group of people that you know you have something in common with and many of those people have not had a decent chat with a person in days it’s really hard to shut them up and couch surfers are, by nature, extremely social creatures. Not to mention interesting. Two of the guys had been sleeping in Termini station because they couldn’t find anyone to host them. Termini station is like.. uh.. hard to describe. It’s really big, old, busy and quite a large number of people live there. Not middle class backpackers, either. It’s about as full-on as European train stations can get. Kind of like a refugee camp/train station. Despite the tour being touted as two hours, Luke and I regretfully tore ourselves away six hours into the as-yet unfinished tour to go have a nap and rest our poor feet, which were unused to so much walking. In the evening we went for a short stroll to a nearby fountain to get some long exposure shots, which didn’t turn out anywhere near as well as I’d have liked, then had a drink at a bar that looked more like a roadside kebab van. The drinks were nice though, and the weather in Rome was perfect for sitting out in the evening. As we sat I contemplated what I’d seen so far of Italian fashion. Italy is definitely a place that can intimidate the visitor in terms of style and flair. Particularly if said visitor is wearing trainers with holes in them and the same two dresses for weeks. Women in Rome are seriously striking and dress beautifully. They wear completely inappropriate shoes and enormous sunglasses. Their hair is dead straight or perfectly curled. They smoke endless cigarettes and throw the butts carelessly into the gutter. They walk tiny dogs, huge dogs, and push prams containing designer-dressed babies. I can’t decide whether I’m delighted, amused or horrified. Probably a mix of all three. There’s this crazy paradox to Italians. So focused on fashion and appearances and being skeletally thin, yet the passionate, almost worshipful attitude to food and drink. Not that I’m complaining. Well, the only thing to complain about is not having enough time, money or space in my bag to go properly shopping. 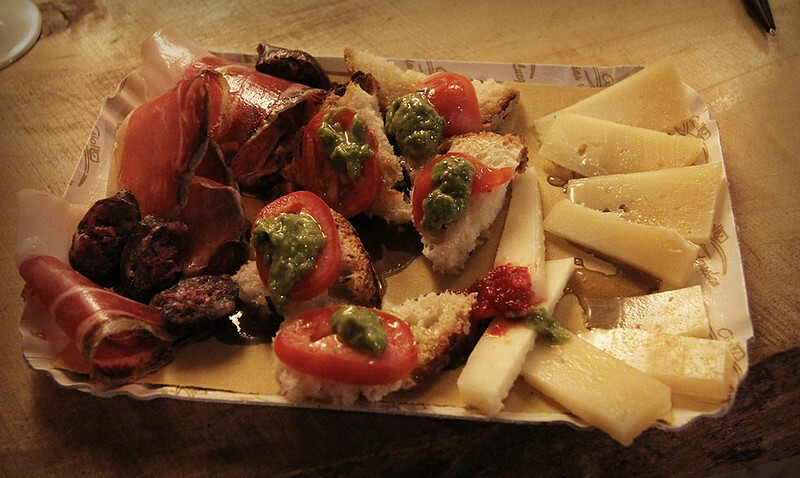 Next stop: Florence… or do you call it ‘Firenze’?